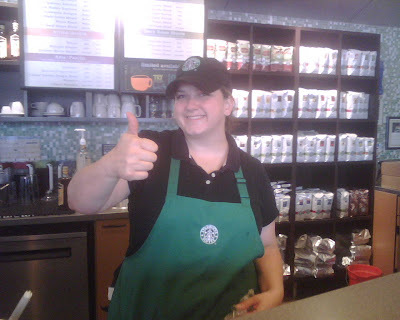 nextGREAThire.com: Jambo, from my Starbucks! Made some new friends at "my" Starbucks this morning, Amanda and Rachel! Say Jambo to Amanda (on the right). She informed me that Jambo is "hello" in Swahili, and she also gave me a nickname in the process - Buna. For the uneducated, Buna means....coffee (in Ethiopia). So, there you have it...a nickname that actually has relevance for me! Rachel also set me up with a Starbucks Passport this morning (on the left), and I completed my first page by trying the new Ubora Blend. And, since they are a perfect pairing (see this), Amanda gave me a piece of Carmelized Apple Pecan Coffee Cake (see the recipe HERE). Holy smokes - good stuff. I'll be hitting the gym this afternoon (thanks Amanda!). Anyway, here's to my new Starbucks buddies - thanks for the education, calories, and nickname!